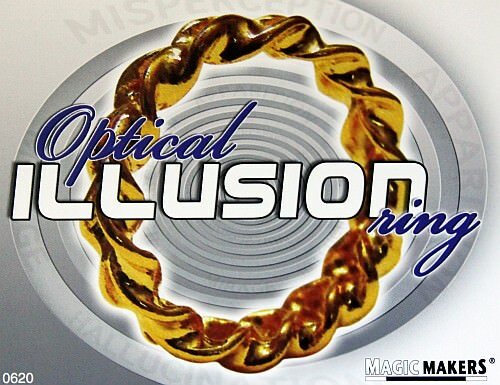 The Optical Illusion Ring from Magic Makers is described as "The magic ring that shrinks and grows". The ad copy says further: "Twist in one direction, the ring appears to grow! Twist in the opposite direction and the ring appears to shrink." What you get is a ring in an attractive gold colour, with an ornate twisting design, and small card with some basic instructions. "Hold the ring between your index finger and thumb. Twist the ring in one direction, and the ring appears to grow. Twist the ring in the opposite direction and the ring appears to shrink." There are other videos that even do a better job of showing the effect, like this one here. There's no sleight of hand required whatsoever, since it's purely an optical illusion, caused by the clever design and the way the light falls on the shiny ring. You can spin the ring in different directions, to make it either grow or shrink. 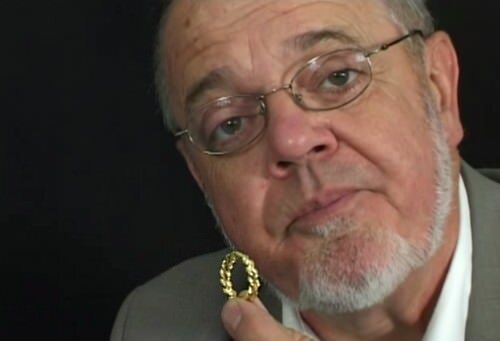 The cardboard instructions offer this quote from inventor Rob Stiff: "The applications of this magical ring are only limited by your imagination." The only real difficulty with this product is that even when using your imagination, it's hard to actually think of a decent routine using this ring. I've come up with some patter about a self-adjusting ring, and having some kind of story to go along with the effect does help. But even then, most spectators do eventually realize that it's an optical illusion of some type. The illusion is very convincing when viewed correctly, and it does look terrific. The challenge is how to turn it into some magic, and I wish that the creators had come up with something to help us get started with that. They're expecting us to use our imagination, but I think it's reasonable to expect them to use their imagination first and give us at least one idea, and it would have been nice to have seen at least one video with an actual routine of some kind. Angles can be important, because if someone is viewing the ring from the side, they won't see any illusion at all, so you do need to ensure that your spectator has a good line of sight. I've found that it's best performed to just one or two people, rather than to a group, because otherwise some spectators won't have an optimal angle, and you'll lose the impact. The ring itself appears to be metal, because it feels too heavy to be plastic, but it is still quite light-weight. The gold colour is shiny and doesn't look fake, although obviously it's not genuine gold. I suspect it might be a plating of some kind, so I couldn't recommend wearing it on a daily basis, because you might find that the colour starts to come off. Perhaps it is hard wearing, but given the price, I expect that it's not - after all it's intended to function as an illusion rather than for daily wear. But it does seem to be fairly well made, and doesn't immediately scream "cheap". The sizing quite good - I have fairly large fingers, and was actually able to squeeze this on my ring finger. But you'll probably not want to be wearing this on a regular basis, so the size doesn't matter too much. You can always demonstrate the effect with your pinky finger if you need to, and you may even prefer to perform the illusion without your fingers at all, to maximize the visibility. 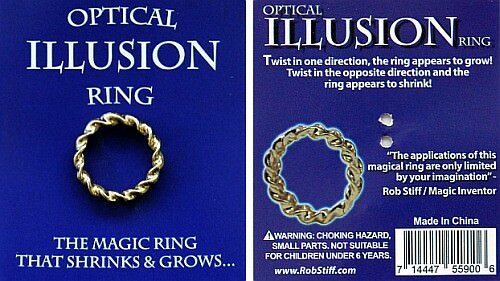 Notwithstanding the challenge about how to incorporate this into some magic, there's no doubt that the Optical Illusion Ring is a fine looking product, and the illusion is a very convincing one. I've found that the illusion isn't completely fooling, because the longer that spectators look at it, eventually they do figure out that it's merely an optical trick of the eye. After 30 seconds, it's done its job, and you need to move on to something else. Even so, most people are impressed with it. Until someone comes up with a decent idea for a magical routine, this product is mostly suited to being used as an eye-catching gimmick and to generate some interest and discussion. It's probably something you could slip in your pocket, and pull out to draw someone into a conversation about magic, and perhaps to arouse their interest in showing you some other magic trick. The Optical Illusion Ring isn't a show stopper by any means, nor is it something you'd build a routine around or do as a trick in isolation. But as a fun gimmick, that typically sells for just under $10, it is well suited to grab people's attention, and to lead into some other magic. When keeping that in mind, it's a piece of shininess that is good at doing what it does, even if it is just 30 seconds of entertainment ahead of some more serious tricks, and to get people interested in you and your magic. I was at a one day magic convention back some years ago and this was the first time I saw these rings. It could be the first time they came out too, but I'm not sure. Things have a way of resurfacing every so often. Anyway, this guy bought one and was so happy to show his wife the illusion; growing one direction and shrinking the other. Not impressed, she looked at him and said, "And what are you going to do with that?" Yeah, that took the wind right out of his sails and a happy purchase quickly turned to buyer's remorse.